London Fashion Week kicked off yesterday morning with endless styles for S/S 2015. I'm positive in the following few days we'll be seeing further colours, textures and new designers hitting the ever so popular catwalk. However for day 1 here is a small selection of my favorite pieces. FELDER FELDER's collection was amazing for the typical festival style. Lots of fun colours and patterns were used alongside leather ankle boots. I also love the constant supply of high neck tops which are featured amongst the three outfits above. 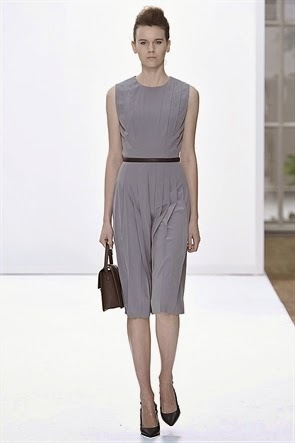 Daks collection was extremely sophisticated and mature. From crispy white shirts, too metallic high heels the outfits were bright and airy. Also it featured pointed shoe which seems to be a key piece in the typical fashionsta's wardrobe. Jeana- Pierre's outfits were very modern and I feel branched out towards woman of the teenage- young adult category. Her pieces were classy yet fun, using mainly monochrome throughout her pieces makes the outfit look swish and ready for that party! I LOVE Paul's collection, especially these two tea dresses which I think would be loved by any woman. Cute flared dresses to the classic skater dress using unique patterns and fabrics. I love how he kept his pieces real, because in reality very few people are going to wear extreme styles you see walking along the catwalk. Lastly Amanda wowed me. I loved her clean- white style throughout her collection. The dresses above are my favorite, because they remind me of a Greek goddess.The dresses are flowing so simply with a belt hugging the waist with the classic strappy stilettos, perfect for spring and summer!